Over 800 churches come together for an exciting outreach endeavor. Everyone has questioned his or her purpose in life at some point. If we are all honest, we long for something greater and better than this human life. Deep down, we want to believe that there is a higher power controlling the Universe. We want to understand the brokenness of this world and reasons for the pain we experience. We naturally want to see the bigger picture. Even though we often get distracted by the busyness of this life, once the noise and distraction in our heads stops, our questions will return. Each week, one of these questions has been the focus of teaching from various pulpits in Chicago. 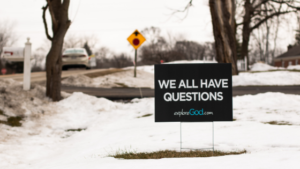 Some churches have extended these important questions into children and youth classes for teaching and discussion, as well as providing free childcare during adult teaching times. Besides formal teaching based on the seven questions mentioned above, small groups are discussing these questions in their homes and inviting neighbors. Christians have been asked to join in prayer for this exciting initiative and are being personally encouraged by the large-scale endeavor of so many churches trying to biblically answer these difficult questions and deliberately spreading the message of the gospel together! Explore God is for Christians! Explore God’s premise of “We all have Questions” about purpose in life, faith, and God is an important topic for Christians. As Christians, it is valuable to get “back to our roots” and study some of the big questions of life. Not only will it help to be ready to answer these questions when asked by non-believers, but it will also force each person to dig deep and challenge oneself to decide what he or she really believes about life and God. It is sometimes easy for mature Christians to forget or to gloss over questions such as, “Does life have a purpose,” and “Is the Bible reliable?” But when we really look at these questions thoughtfully and deeply, we must also honestly look at our own lives to see if we are really living in a way that believes the truth of God’s Word. It can also be rejuvenating to ask these questions once again and strengthen our faith as the truth is revealed in a fresh way. Explore God is relevant for non-Christians. Not only are these questions an important focus and challenge for Christians, but they are also relevant and current questions for non-Christians. But none of us has been left without answers. As people seek to honestly find answers, God will reveal the answers in His Word and through relationship with Him. Gospel-preaching churches have an incredible opportunity to share answers from Scripture and life experiences of individuals and how God has brought many from darkness into His beautiful light! At Sermon Transcribers, we are pleased and privileged to have a small part in “Explore God Chicago 2019” by providing sermon transcripts of these topics for our clients that will be used as a resource for further study and discussion. We pray that many will seek to find answers from God’s Word and the Church. Please pray with us during the remainder of this important series that many will come to the Father as they seek for answers to their questions through Jesus, the Way, the Truth, and the Life! A team of transcribers, editors and proofreaders with a strong commitment to handling God’s Word accurately.